Congrats @nycparks #datajam winners!! NYC #opendata + #nyctreescount + #hackforchange! On Saturday, 4 June, NYC Parks hosted its second Data Jam, unveiling NYC’s latest urban forest dataset, the most spatially accurate map of New York City’s street trees ever created. Together with BetaNYC, NYC Parks hosted NYC’s fourth National Day of Civic Hacking event. 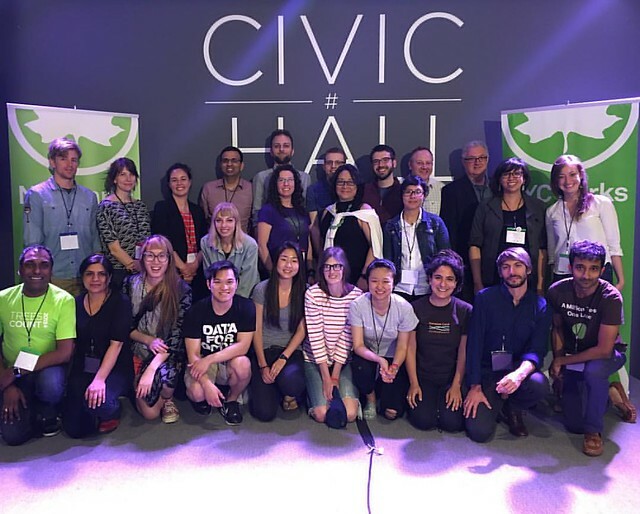 This is the first time NYC government collaborated with members of NYC’s civic hacker and open data community to host a day-long civic engagement event. For the day, government staffers partnered with tree stewards and community groups, civic technologists, data experts, and designers to help transform the data into actionable insights. The Data Jam is an extension of NYC Parks’ TreesCount! 2015 participatory mapping campaign to spark and sustain public engagement with NYC’s urban forest through data. Since May 2015, more than 2,500 volunteers have participated in mapping NYC’s street trees. To date, more than 530,000 trees, representing approximately 80% of NYC’s streets, have been mapped as part of the 2015 Street Tree Census. On Saturday, 196 participants got their first hands-on look at the street tree data that has been collected to date. For the first six months of 2016, NYC Parks worked with TreesCount! Partners and held internal workshops to source problem statements and questions that were used to derive five Data Jam challenges. At the event, the challenges were represented by Parks staff and community stakeholders. Our collective goal was to spend the day building insights for a more equitable urban forest. The day was broken up into two tracks. Twenty-seven participants engaged in a six hour long workshop teaching them NYC’s open data portal and the nuances of mapping and data exploration, while 144 experienced participants explored the five challenges. By the end of the day, 23 projects were conceived and built to compete for six prizes. The event was organized by NYC Parks in partnership with BetaNYC. Support for this event was provided by the Mayor’s Office of Technology + Innovation, NYC Open Data, our host Civic Hall, Microsoft Civic, and CartoDB. The TreesCount! Data Jam embodies NYC digital priorities such as NYC’s vision for Open Data for All, and the NYC Digital Playbook. Open Data for All laid out two core beliefs – that every New Yorker can benefit from Open Data, and Open Data can benefit from every New Yorker. A central tenet of the NYC Digital Playbook is to foster more collaboration with engaged citizens and civic technologists. Therefore, NYC Parks designed the Data Jam to bring together community members with civic hackers and Parks staff to collaborate on data challenges, and incorporated an Introduction to Open Data workshop for beginners interested in learning to use to Open Data. The most important insights we developed was the evolution of a “user centered data release workflow.” Build off of user centered ideas, we believe that data sets should go through some user testing and like all products fit into a continuous improvement loop. We’d love to hear your comments on the following three phased user centered data release workflow. Please leave a comment below. • Upload data set and data dictionary to Portal with an event or video explaining the key features of the data. • Allow time for user testing on Portal and gather open feedback. • Share insights and communicate them out to the public. Continue to gather public feedback. The qualitative effect of trees on improving pedestrian comfort is well known and intuitive; a quantitative assessment of the direct benefits of trees on reducing high temperatures and high humidity in their immediate vicinity would provide a valuable tool for reducing the urban heat island effect. In order to efficiently plan for the long-term health of trees, we wanted to benchmark costs. Using average costs for different work orders, such as pruning, removal, planting, we visualized 311 costs over time. Description: “Treezy” is a mobile app for matching users with nearby trees in most need. Users can update stewardship activities and alerts will be personalized and designed to build a connection between people and trees and their needs. Additionally, events can be organized within the app among users in the area. Description: The goal of this project is to estimate the citywide water absorption that could result from the complete implementation of tree guards. We then provide a recommendation list for a specific community group to construct and install tree guards in their stewardship zones to improve tree health and reduce stormwater runoff.